From the first to the second, not yet the third... My first book published can be found on Amazon. My second is about to begin its process from mind to paper. As it must be clear enough, I have an interest in autism. The next book will be about the autism spectrum conditions. After completing a master's degree on autism, I am most certainly eager to write more! I am looking forward to beginning the writing for it. I have a publisher in mind for this one. I will keep focused on completing a high-quality book, then submit my next masterpiece. 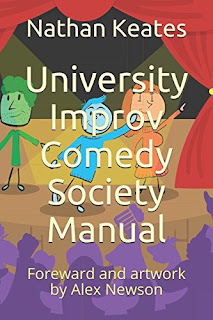 The first book, University Improv Comedy Society Manual, had a long process of looking at my teaching discoveries and then adapting it to suit universities or colleges. As the blurb states, the curriculum works for the limited time that students have each year. It helps guide students through the needs of scenic improv comedy art forms and give them the necessary chance to continue the society further on. Once complete, the students will be highly talented in the general improv comedy world. So much joy can happen in society groups. The experience can really help in life and academia, as Alex Newson writes about in the book. I thoroughly enjoy his solo show that popped into existence during my year with that society. 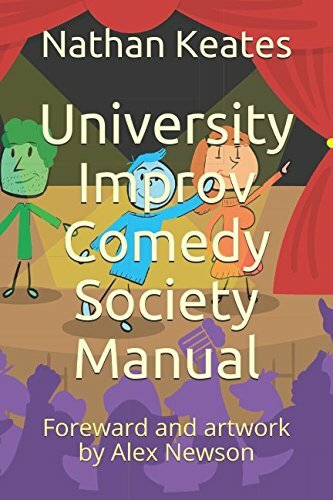 There are a lot of funny times and crazy wonderful moments that can occur in improv, in hanging out together and touring around to gigs; I advocate it a lot, so get the book and begin your improv comedy society! This one time, at improv comedy soc, I found a new way into a trance state using the students' focus.